At which point, I fumbled an incoherent response attempting to articulate all of the dials and graphics and tools and drop downs I’d just witnessed. Ultimately, I judged this encounter a failure, but I realized that I had to get to the bottom of his question in terms of what were all of those shiny new features? I recounted this story to Meyer Sound’s John McMahon, VP of solutions and strategy at Meyer Sound, who was kind enough to fill me in with the details. Beyond that, the phase integration was revamped, which addresses the different generations of Meyer loudspeakers produced over the years that have fallen into various phase categories in terms of response and how much phase correction that’s been done on them. 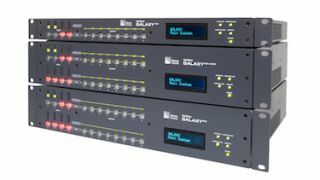 With Galaxy, “the vast majority of our loudspeakers are now in the delay integration, so it makes it really easy to mix and match products over the years and have them stitch together seamlessly in terms of phase response, which is really quite important,” he said. McMahon concluded by noting that there are a lot of other things coming for Galaxy down the road. Lindsey Adler is editor of SCN. Follow her on Twitter, @lindseymadler.